Cannon Street has no connection with guns or even billiards as the name might suggest, for the candle-makers and wick-chandlers who made their wares for the Church lived here in the late Middle Ages. It was first mentioned in the records of c.1180 as Candelwichstrete (from Candle and Old English wic, 'a dwelling'). Through a series of name-shortenings and the Cockney dialect the name was contracted to Cannon Street by the mid-17th century and this modern form was noted by Pepys in his famous diary in 1667. On the site of the present mainline station was once the Steelyard, a store to which members of the German Hanseatic League once brought their goods for sale. The main line station was opened by the South Eastern Railway on 1 September 1866. 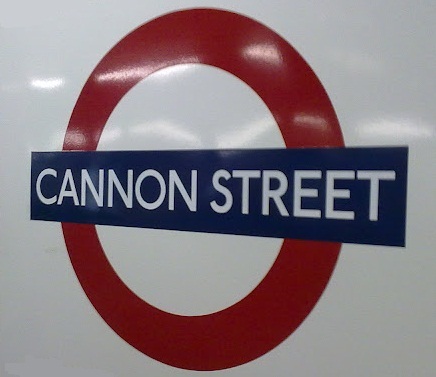 The Underground station was opened also as CANNON STREET on 6 October 1884.